A mom of 3 knows how momentous a boy’s first birthday party is, after all she has learned by now how fleeting those first years of life are! With loads of parenting and partying throwing experience under her belt, talented mom, Meredith Eisele designed this woodland party with a specific feel in mind—sweet, vintage, and eclectic. She hoped it would have more of a backyard wedding feel than a child’s birthday party feel. When you peruse the party photos, you’ll agree that Meredith achieved her objective. Her gorgeous sense of style is evident in all of the well-curated party decorations and sweet details. Just wait until you see the trio of birthday cakes, including a smash cake for the birthday boy! The handmade party favors are over the top! These woodland themed birthday party supplies are great options for adding themed details to your party styling. Check out this roundup of 26 woodland themed boy party ideas for loads of inspiration. Every great party starts with a solid plan. Knowing the look and feel she wanted, Meredith planned early for this special celebration. 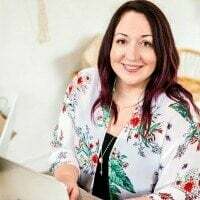 She frequented flea markets and discount stores like Goodwill to collect the perfect vintage pieces for the styling outcome she desired. Vintage lace curtains, baby shoes, and the silver serving dishes were some of her fabulous party finds. To bring in that woodland feel, she designed the party around an earthy color palette of tan, gray, white, and chartreuse. Incredible textures were used to keep the decorating on the “boy side” of beautiful. Meredith’s use of moss throughout the décor provided a rich aesthetic. I especially love the moss-covered paper mâché letters used on the dessert table to spell out Colin. Paired with a variety of woodland creatures, rustic wood rounds turned cake stands, and mixed bouquets of flowers, the scene was set for a beautiful soiree. Two cakes were created for guests and one additional cake was made as a smash cake for the birthday boy. I love the personalized name banner and colorful fabric bunting used as toppers for the two guest cakes. Coordinating cupcakes with decorative monogram toppers were another great dessert option. I love that the desserts were mixed in with precious pictures of the birthday boy! Serving up brunch is almost always a great way to keep guests happy at a first birthday party. With a menu that included an assortment of quiche, savory crescent sausage bites and sausage balls, seafood crab cakes, two varieties of muffins, and other delicious eats, how could you want for more? A special table was styled as a “thank you” table for guests. A chalkboard sign read, “Thank you for celebrating my first every birthday.” Homemade party hats in a mix of navy, white, tan, and chartreuse, were embellished with the cutest notions. Pom balls and ricrac just make everything adorable! Hanging on the wall was a brilliant party favor display board. Handmade bow ties, hair bows and wearable fabric flowers were carefully clothes pinned to rows of ribbon. Guests could get gussied up for the celebration right on the spot! The party was filled with the sweetest baby details. Take this wooden display case for example. Check out the vintage baby cup, first pair of walking shoes, and darling silver bunny that were carefully placed inside the case. These items are memorable tokens of a baby’s first year. Not only do they make for a great addition to the party decorations, but they can be saved for years to come as special mementos. Three smiling brothers can only mean one thing—the party was a success! It’s so fun to see the two oldest brothers sporting their coordinating bow ties, with their baby brother in the middle wearing his adorable party hat and bib! And don’t you just love the backdrop decorations? A monogram C made from coffee filters paired with fabric pennant banners and photos of the birthday boy are a winning combination! Planning a woodland themed boy’s birthday party? Check out these party sources put together by the Spaceships and Laser Beams crew. 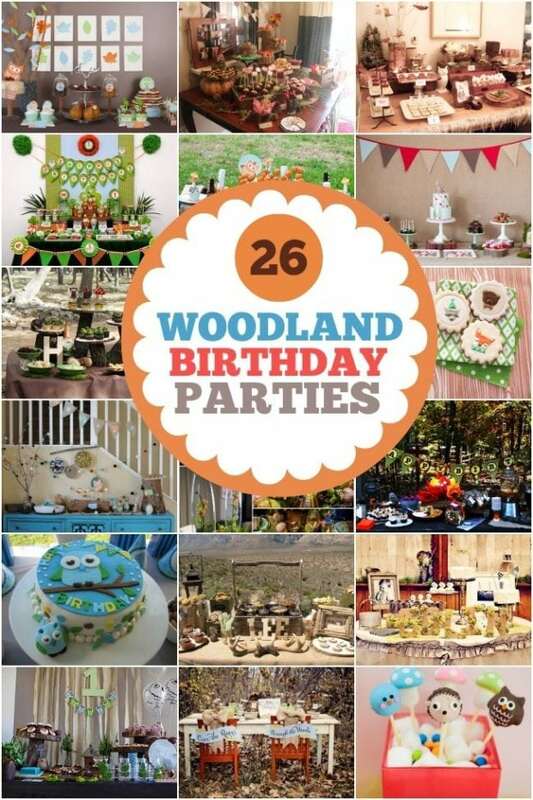 Be sure to check out some more woodland themed party ideas here.